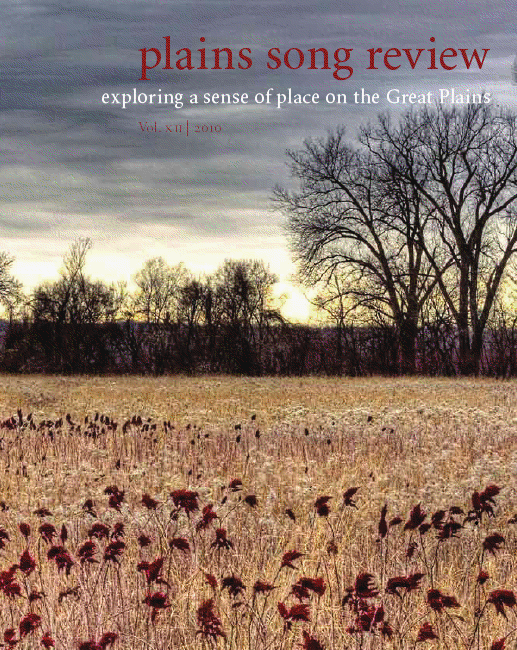 Plains Song Review Online: PSR XII is printed! Hello friends of PSR! I just wanted to tell you all that the twelfth volume of Plains Song Review has come back from the printers. They will be available at the reading on April 21st, and after that on our website. An interview with Timothy Schaffert, author of Devils in the Sugar Shop, The Singing and Dancing Daughters of God, and The Phantom Limbs of the Rollow Sisters. Work by: Marge Barrett, Alicia Bones, Faye Tanner Cool, Suzanne Dawson, Marilyn Dorf, Tom Hansen, Twyla Hansen, Leah H. Hebner, G. Thompson Higgins, Janet Kamnikar, Mallory Kerns, Mary Logan, Judy Lorenzen, J.J. McKenna, Madeline Moore, Molly O'Dell, Andrew Oerman, Frances Patterson, Christina Petroski, Amy Plettner, Claudia Reinhardt, Dee Ritter, Natalie Schwarz, Red Shuttleworth, Don Thackrey, Jessica Vetter, Rex Walton, Deb Walz, Marydorsey Wanless, and Don Welch.